The Rhine river is one of the most romantic and beautiful rivers in the world. It is also the most important and the 2nd longest river in Western Europe. It is about 766 miles long and it originates from the Swiss Alps. This beautiful river flows and runs through six countries across Europe, namely Switzerland, Austria, Germany, Liechtenstein, France, and the Netherlands. The Rhine River has 4 sections: Lower Rhine flows between the North Sea at Hoek van Holland, Netherlands and Bonn Germany. Middle Rhine Valley flows between Cologne to Mainz and the Upper Middle Rhine River flows between Koblenz (where the Rhine and Mosel Rivers meet) and Rudesheim. Lower Rhine Valley flows between Bingen and Basel and then to Lake Konstanz, Switzerland. Although the Rhine flows in different countries, the Middle Rhine River valley located in Germany offers the best views. One of the most popular 7 night Rhine River Cruise itineraries is Amsterdam to Basel. There are shorter cruises that cruise in the Middle and Upper Middle Rhine Valley where many of the Castles and Vineyards are most commonly seen. 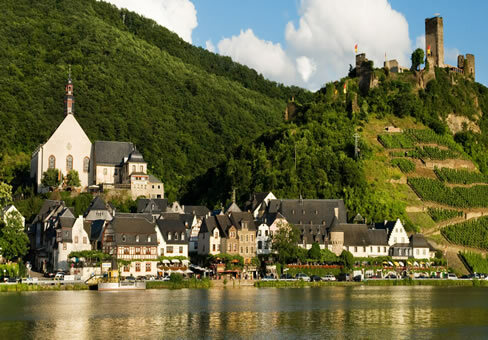 This area is also popular for Wine Themed Rhine River Cruise itineraries. On the Rhine, a variety of itineraries depart from Amsterdam, Strasbourg and Basel. Experience the famous bend near Basel through the valley of the upper Rhine and then the Gorge (including the famous Lorelei), leading into the Lower Rhine and the Netherlands, viewing vineyards, castle ruins and pretty villages along the way. Within the Middle Rhine Valley, Cologne is a major stop on a Rhine River cruise. Rich history (became a city in 50 BC) and with a mesmerizing old town charm, it has a romantic and peaceful vibe. Cologne is filled with different tourist spots such as the Cologne Cathedral, the Wallraf-Richartz (one of the most important art galleries in the Rhineland) and Ludwig Museums, the Roman-German museum, the Cologne cable car, St. Pantaleon Church, Augustusbura and Falkenlust Palaces, Altenburg Cathedral, and the Zoological Gardens. Near the main trains station and the Cologne Cathedral is also located the Chocolate Museum - if you like chocolate this is worth a visit for the history and the great selection of unusual chocolates. During the Middle Upper Rhine Valley, while cruising from Koblenz to Rudesheim, you cruise past the beautiful Rhine castles in Germany like the Castle Marksburg, Castle Martinsburg, Prince Elector’s castle, Castle Sooneck, Castle Bromserburg, Castle Katz, and more. The area between Koblenz and Mainz on the Rhine River have been designated a UNESCO World Heritage site. Koblenz is a town surrounded by low mountain ranges, There are old forts and walls that are at the top of the mountains the most outstanding is the Ehrenbreitstein Fortress, which rises 118m above the Rhine. Koblenz is a mixture of the historical and the modern - with cafes and shops on the street with countless churches and historic monuments. Rudesheim has a really interesting Musical instrument museum - Siegfried's Mechanical Musical Instrument Museum - really worth a visit. You can also enjoy a gondola ride up to the vineyard for a wine tasting. There is a main pedestrian street with lots of cute shops and at night the Drosselgasse (main wine street) has lots of great taverns for tastings. The city of Mainz is on the west bank of the Rhine, west of Frankfurt. Mainz dates back to Roman times, with many excellent museums such as the Roman-Germanic Central Museum, the Museum of Ancient Navigation with its full-scale replicas of Roman galleons, the Gutenberg Museum, which is dedicated to the history of printing! Here, you can marvel at original Gutenberg Bibles from the 15th century, take part in a printing press demonstration and explore various relics related to printing history from around the world. A Rhine river cruise also includes wine tastings, beer tastings, and wine excursions. It also includes Heidelberg excursion, Strasbourg city tour, Basel city tour. Another great Rhine River itinerary is one during the Rhine in Flames celebrations. Whether you prefer a 7-night cruise or a shorter itinerary, the Rhine cruise has so much to offer. You’ll get to do many activities and enjoy the beautiful sceneries that Germany has to offer. Regular priced cruises between April and October, include a beverage package - Soft Drinks, as well as tea and coffee specialties, Beer, sparkling white wine, Cremant and Prosecco (in a glass), as well as open wines and daily recommendations from the wine menu (by the glass), Cocktails and long drinks throughout the day and evening. Sightseeing excursions are not included and need to be pre ordered to assure English language tour guide - pricing between $50 - $100 per person.